Shortly after arriving on Cape Cod to spend a year by herself, Joan Anderson's chance encounter with a wise, playful, and astonishing woman helped her usher in the transformations and self-discoveries that led to her ongoing renewal. 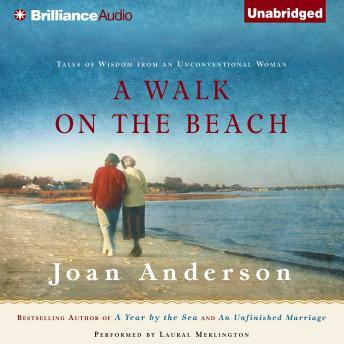 First glimpsed as a slender figure on a fogged-in beach, Joan Erikson was not only a friend and confidante when one was most needed, but also a guide as Anderson stretched and grew into her unfinished self. Joan Erikson was perhaps best known for her collaboration with her husband, Erik, a pioneering psychoanalyst and noted author. After Erik's death, she wrote several books extending their theory of the stages of life to reflect her understanding of aging as she neared ninety-five. But her wisdom was best taught through their friendship; as she sat with Anderson, weaving tapestries of their lives with brightly colored yarn and exploring the strength gathered from their accumulated experiences, Joan Erikson's lessons took shape on their small cardboard looms as well as in her friend's revitalized life. In writing about their extraordinary friendship, Anderson reveals a need she didn't know she had: for a mentor to help navigate the transitions she faced as she grew beyond middle age. And when Joan Erikson had to face her husband's death and the growing limitations of her own body, Anderson was able to give back some of the wisdom she had gleaned. To this poignant and ultimately joyful account, Joan Anderson brings the candor and sensitivity that have made her an acclaimed speaker and writer on midlife and its possibilities. A Walk on the Beach is an experience to savor and treasure, a glimpse of the exuberant spirit that can be sustained and passed on in all our friendships.